Social media marketing has nurtured the growth and transformation of branded content. Long after its origins in mass media advertising, the concept is gaining traction in social media marketing too. But what is branded content? Finding a singular definition of branded content is not easy. This is because it is often confused with some other popular terms. Here we work towards understanding what branded content is by differentiating it from other concepts. Branded content is often contrasted with content marketing. The value-add each type of content brings to the customer is the main difference. Branded content is perceived to be more consumer-centric. It provides something of value to the consumer. This is usually in the form of entertainment. This type of content often resonates with the consumer at an emotional level. If you watch the video you will see that Pillsbury tries to provide some useful information to their audience. They do not aggressively display the brand name or the logo. Even the product they use within the video is shown only for a brief second. They have also successfully adapted the Buzzfeed Tasty format that has gained popularity among large sections of the social media audience. Content marketing on the other hand is all about the product. The intent here is to sell the product. Here, the content draws attention to the USPs of the product, key features etc. It urges the consumer to buy a product which will solve a particular problem they have. Often content marketing tries to camouflage itself as branded content. A typical example is the long lists titled ‘X tools that will help you succeed in your…’. You conveniently slip in your own product as one of the tools. There is often a clear call to action or a link that takes you to a purchase page or a sign-up form. Branded content is meant to provide a more immersive experience for the consumer. This is a vehicle for communicating what the brand is all about, the kind of lifestyle it vouches for, the ideals it stands by etc. It can help build brand loyalty over time. Native advertising involves promoting your content through the editorial feeds of publishers. This usually involves paid efforts. Even Facebook technically is a publisher. So, this includes sponsored content on your Facebook feed as well as content features on other websites/blogs that resemble their editorial. Native advertising is a way of ensuring content discovery and is primarily focused on sales and lead generation. That is, by using native advertising you can make sure that consumers will find your brand messaging in their Facebook Newsfeeds and other places they visit online. To aid this, brand and product names are often highlighted. Branded content involves a lot of creative efforts and expenditure. In order to make sure that these get a good reach, they are often boosted. This complicates differentiating branded content from native advertising. There is a clear stress on the publisher here. Branded content is not created by brands. Instead, publishers or influencers tie up with brands to create such content. According to a recent change in their branded content policy, Facebook has made it mandatory for publishers to clearly indicate sponsored content of this sort. Hum roped in Mashable to publicize their solutions with a crazy stunt. Mashable is the perfect publisher to partner with. They are the go-to for wacky, weird news for a large chunk of social media audience. Like other changes Facebook has made to their algorithm, this too is aimed at bringing every Facebook user the most relevant content. Moreover, this offers brands in-depth analytics to measure which publisher or influencer is working out the best for them. So far, what we’ve discussed about branded content are not strictly confined to social media. In short, brand messaging that is not pushing a sales agenda and provides a value-add to the consumer counts as branded content. On social media, brands have to constantly adapt. They have to respond to changes in social media platforms, and more importantly, based on how consumers react to their content. It’s become painfully obvious that they do not like being sold to. Even if a brand pays their way into scoring some premium social media landscape, it comes down to the consumer to decide if they want to engage with it or not. We looked at the 20 most-shared Facebook posts by brands during the first half of 2017 (see image below). Of these only 4 were product-related. Out of these 4, 2 were promotional offers. Clearly, engagement patterns on social media show that consumers are more likely to respond to non-salesy content. Brands, then, are forced to ask themselves difficult questions. What returns do they get out of their social media presence? Especially if they cannot push their products. Branded content emerges as an answer to both these problems. Storytelling as a strategy engineers an emotional connection with the audience. Many brands now share content that addresses a societal issue. Sometimes these celebrate a set of values, principles or an ideal way of living. It is also common for brands with a niche audience to tap into a specialized interest. Think of the QSR brand Arby’s that does some ingenious stuff targeting gamers. The brand name, logo or a call to action will be conspicuously absent in these messages. Instead, branded content builds the image of an ideal consumer (in the ways described above) with compelling content. Social media audiences will aspire to identify with this image. This leads them to engage online (in terms of likes, comments and shares). In the long run, this plays a significant role in fostering brand loyalty. In RoI terms, narrative-based branded content aids in brand recall, purchase decisions and in the long run, produces a community of passionate subscribers. Instead of making the content all about the products they have in store, the brand addresses the concerns that many parents of school-going children might have. With two simple sentences (‘Back to school. Forward with confidence’), the brand reassures them. This creates a feeling among the audience that the brand “gets them”. Similarly, there are a lot of brands that have won engagement with empathetic content. Remember Hyundai’s Super Bowl ad or Walmart’s Veteran’s Day content? In both these cases, the brands directly addressed the community of military families. By talking about their pain points, the brands were able to relate to them. If you take a quick look at the comments, you’ll see that most of them are from family members of veterans or soldiers. Brands would regret missing out on the amazing returns that branded content brings. 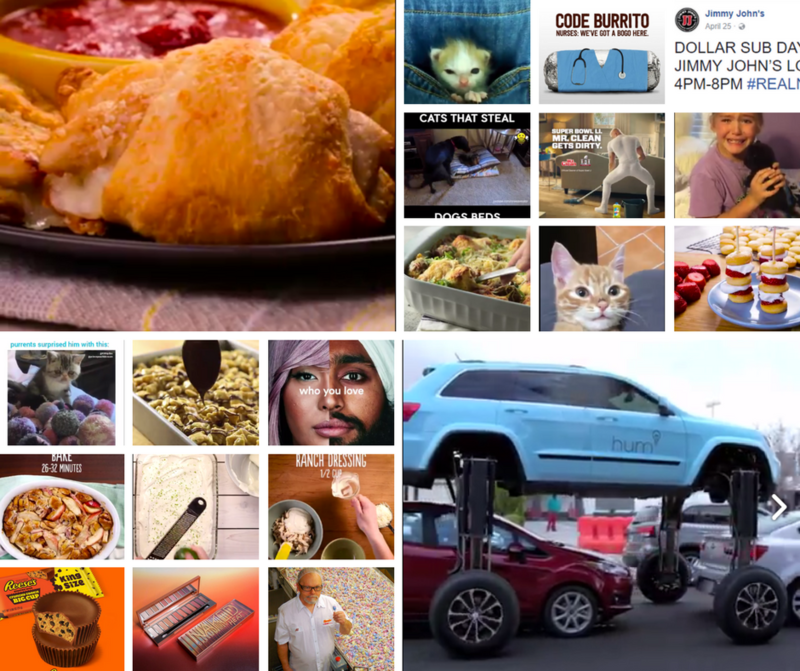 An easy way to find inspiration for branded content is to use a content discovery platform. With Unmetric Discover, for example, you can see upcoming events and popular topics in your industry. You can then zoom in on engaging pieces of branded content created by your peers. Summary: Why create branded content? Take me to Discover now!